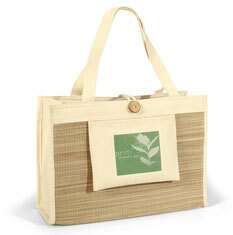 Transport your spa, beach or travel gear in this spacious, earth-friendly tote Front straw panel and coconut button closure provide added appeal Exterior pocket for keys and other small items 20" shoulder straps This product is made from 100% organic cotton fabric. Materials: Straw/12 oz. organic cotton.